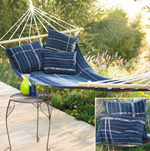 This brilliantly-hued hammock is guaranteed to make your summertime livin' easy. Made from vintage Guatemalan corta, or skirts. Shipping within the United States and its territories only.